Just about everyone with strong political convictions is posting tributes to or critiques of Hugo Chávez today, so I will too, even though I have nothing interesting to say about him. I was not a fan of Chávez, c’est le moins que l’on puisse dire, as I am not a fan of caudillos or demagogic military tough guys, even if they happen to enjoy mass support among the poor. And I can hardly sympathize with someone who palled around with the likes of Muammar Qadhafi, Mahmoud Ahmadinejad, or Jean-Luc Mélenchon. Chávez did do some good things for the lower classes—which is only normal given Venezuela’s hydrocarbon wealth—but he also did many not good things for his country’s economy. When a strongman takes control of a rentier state and makes it even more rentier, that’s not a sign of good governance. It does not merit admiration. Instead of blathering on, particularly as I have nothing interesting to say, I will link to a few worthy pieces I’ve read on Chávez today. Guardian correspondent Rory Carroll’s NYT op-ed, “In the end, an awful manager,” was quite good. Also Andres Oppenheimer’s analysis in The Miami Herald, “Chávez’s ‘revolution’ will lose steam abroad, but not at home.” Venezuelan political scientist and blogger Francisco Toro’s piece in The Atlantic, “Chavez wasn’t just a zany buffoon, he was an oppressive autocrat,” may also be read. And there’s Human Rights Watch on “Chávez’s authoritarian legacy.” Et en français, on peut lire la tribune par le journalist Michel Faure dans Rue89, “Hugo Chavez : un mirage calamiteux créé par les pétrodollars.” I was reading in the past hour—in The Guardian, I think—a paean to Chávez by Tariq Ali but started to gag halfway through, so no link to that. 2nd UPDATE: Amherst political scientist Javier Corrales has an excellent analysis in FP of the political economy of chavismo, “The house that Chávez built.” Entre autres, he describes an economy so badly afflicted with the Dutch Disease that it gave rise to an even more virulent strain of this, which he coins the Venezuelan Disease. 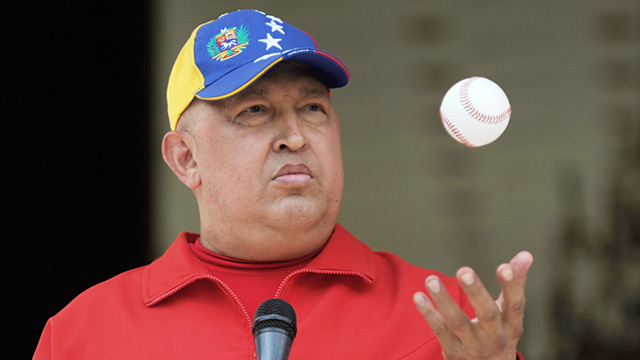 Also focusing on the economy, The New Yorker’s John Cassidy explains why “Venezuela’s ‘resource curse’ will outlive Hugo Chávez.” In his article Cassidy refers to a critical assessment of Chávez by the well-known Venezuelan political economy pundit Moisés Naím—a Washington Consensus type—in Business Week, but his link to the piece doesn’t work. It does here. Tariq Ali had always been a rank apologist for Chavez, so it is no wonder he would write an absurdly laudatory obit. I think your old Volvo has a better chance of an upward ascend than Hugo who seemed to enjoy, as he said at the UN, a more sulphurous surrounding. By some freak chance, we had Brazil’s ambassador yesterday talking to our students here. His take on Chavez, from a Brazilian perspective, was double. Chavez pulled all the right strings, first, and he was an immensely popular figure for vast stretches of Latin American opinion, including in Brazil. This did lots to sell the idea of Latin American continental cooperation to populations. However, he was an obnoxious loud-mouth, someone with whom work was difficult – the exact contrary to Brazil’s diplomacy, where good looks and a bubbling economy are used to massage Latin America into more regional cooperation. Former President George W. Bush said it best, and succinctly, in his own inimitable way: “Chavez is Castro without brains”. As told to Ambassador John Bolton. Another brutal, ruthless dictator will meet his maker. And the $2 Billion dollars he socked away, stolen from his own people? Particular shame goes to Jimmy Carter, Jesse Jackson, and Joe Kennedy, not to mention the mindless Hollywood gauchistas and their counterparts in France. Cincinna: I was not a fan of Chávez, as one may glean from my post and the articles I link to, but now you oblige me to defend him. Chávez may have been a lot of things but a “brutal, ruthless dictator” he was not. Every election held during his years in power was free – i.e. not rigged or fixed, and with the result reflecting his veritable level of support -, he accepted the (very narrow) failure of the 2007 referendum, and the opposition, while subjected to undemocratic measures, was not banned, repressed, or imprisoned. And to quote the brain-challenged George W. Bush on this – and who backed the failed coup d’Etat of 2002 (how democratic of him) – is a bit rich. BTW, if you’re going to continue commenting on my blog I’m going to ask you to state your veritable identity, i.e. your full name (either on the blog or by email; and also to cease using bogus email addresses). All regular commentators of my blog have done so and now you need to as well, thank you.